A dramatic advance in the study of stress responses has been the mathematical analyses of biological rhythms which have allowed us a window to the working of these autonomic systems. The objective of BioScan is to promote better stress coping strategies for individuals by informing them how to gain control of their ANS and their body's stress response while building stress reserves through appropriate lifestyle changes. The BioScan Physical Stress Assessment reveals the level of physical stress in the body which has accumulated over a continuous period of time. The physical stress level is calculated primarily on the basis of the HRV parameters related to the frequency distribution of the cardiointervals. Knowledge of stress levels can enable patients to make lifestyle and social changes to alleviate high stress thereby reducing health risks, improving overall conditions and promoting prevention. 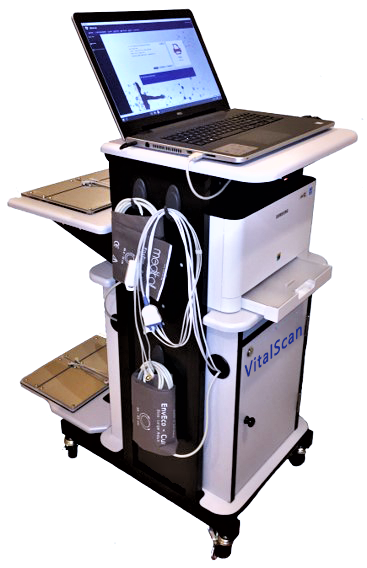 BioScan provides the accurate measurement of stress, stress responses and reserves to cope with stress. This will help us to develop treatments for stress reduction to avoid its damaging effects and to increase our stress resisting reserves. The difficulty in assessing job strain is related to the multiplicity of factors that can affect it (ie. both perceived and objective stressors, the potential moderating effects of social support, personality factors, non-work factors, level of physical health and demographic measures). Whilst all of these factors are important, trying to quantify any of them or their level of impact on the individual is very difficult. Measurement of HRV by the BioScan system now makes this possible. BioScan, because it is based on a physiological assessment of the body's key regulatory systems, is able to provide an index of physiological strain and more importantly identify individuals who are vulnerable to work stress and burnout due to lack of reserves for coping efficiently. The BioScan Mental Stress Assessment reveals the level of mental stress in the body which has accumulated over a continuous period of time. The mental stress level is calculated primarily on the basis of the HRV parameters related to the frequency distribution of the cardiointervals from the histogram (these are the time-based parameters of HRV). Knowledge of stress levels can enable patients (and employers, where applicable) to make lifestyle, social and workplace changes to alleviate high stress thereby reducing health risks, improving overall conditions and promoting prevention. Functional age is assessed based upon the equilibrium that exists between the sympathetic and the parasympathic branches of the autonomic nervous system. Increased functional age is reflective of higher sympathetic activity and vice versa. BioScan calculates functional age by comparing individual data with that of over 50,000 test subjects of predefined age groups. The resulting value is reliable, accurate and relevant. As more and more studies continue to show significant linkages between cumulative stress and serious illness, like cancer, diabetes and heart disease, the necessity for precise, frequent and mandatory health risk assessments becomes increasingly apparent. The BioScan accumulated stress assessment addresses this need for preventative healthcare by facilitating accurate medical examinations for individuals or groups. While the dangers of cumulative stress are abundant, they are predictable and avoidable if momentary stress is properly addressed and managed. Using BioScan assessments, momentary and cumulative stress levels can be accurately quantified and treatment can commence. Lifestyle rehabilitation (i.e. quitting smoking), emotional self-management (i.e. anger management programs), proper relaxation (i.e. breathing techniques) and other interventions can produce dramatic improvements in overall health thereby alleviating the effects of stress and reducing the risk of associated ailments.